Production process for custom Texturite™ Selective Textured Front Panels starts with hard-coat clear material, such as LexanÂ® or MylarÂ®, and results in selectively textured sections. Panels can highlight keypad buttons for smooth tactile feel or visual effect and accentuate logos. Production of various window combinations, high gloss buttons or accents, and selectively textured panels is possible. 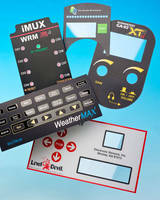 Applications include keypads, graphic overlays, panels, and name plates.